South of the city of Prenzlau in the north-east of the former German Democratic Republic, the Soviets had a helicopter base. Before the wall came down, the unit was relocated to Templin / Gross Dolln. In June 1998 we visited this place on our way back from an air show in Poland. We were possibly the first Dutch aircraft spotters trying to find this airfield. Unfortunately there wasn't much left. Part of the barracks area was now transformed into a school. Much demolition, digging and reconstruction was taking place. We saw huge piles of concrete plates, remains of a former runway? The only vague proof we found was some PSP plating, very typical of a Soviet helicopter base. Another possible clue were the shells we found a quite large numbers. I received many helpful e-mails about the identity of these cartridge cases. Unfortunately it turned out to be 14.5 mm KPV heavy machine gun ammo used by BTR-60PB, BTR-70, BTR-80, BDRM-2 armoured vehicles and ZPU-1, -2 and -4 (AAA). Interestingly, it was identified as a real 'combat' round instead of a blank round, which has a different case. 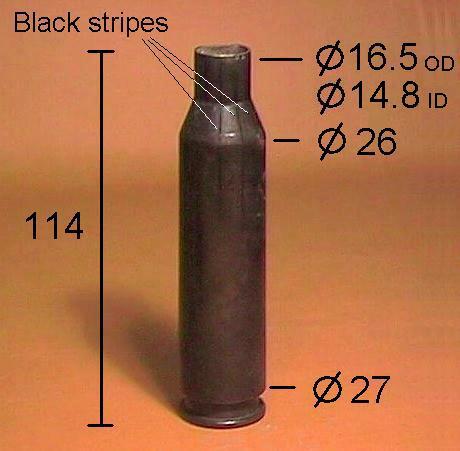 Also, the internal diameter of 14.8 mm instead of the expected 14.5 mm was explained as being the result of the round being fired. Also of interest was that the link belonged to another type of ammo. 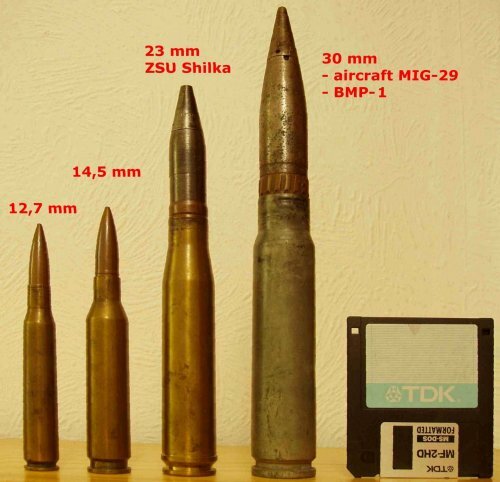 It was identified as belonging to 23 mm ammunition, as used in the ZU-23-2 towed anti-aircraft gun system and the ZSU-23-4 self-propelled anti-aircraft gun system (Zhilka). An example of the shells we found. 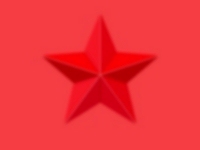 Dimensions in millimeters are shown in the photograph. Inscriptions on the bottom are (clockwise, 12, 3, 6 and 9 o'clock positions): 3 * 50 * . I found the dark vertical stripes quite typical. This picture shows the links we found in roughly equal numbers as the shells. They had two inscriptions stamped on the inside. Another picture of the link. The shell fitted in the link, because I thought the belonged together (they don't). And I also learned that the link is upside down! 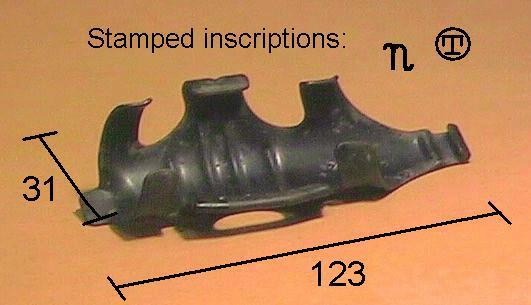 The hook-like end should point to the rear of the shell. Another lesson learned ..
Thomas Fischer, who worked in military disposal facilities where munitions were disposed or recycled, sent me the photo below in 2003. 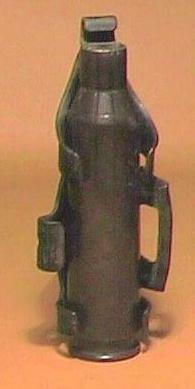 It shows the munitions discussed above in their full glory.